Congratulations to Woolclip, organisers of Woolfest, and especially Cecilia Hewitt, for hosting the most spectacular knitted sheep auction that has ever been held anywhere, ever. I am still waiting for pictures of the auction, but here are the 120 sheep in 47 lots, waiting for the auction to start. 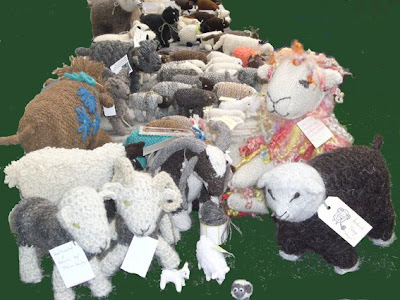 As he slammed his hammer, Adam the auctionier said many of the knitted sheep ended up dearer than real sheep.